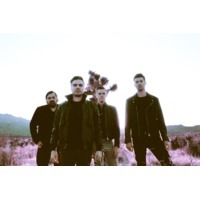 The Boxer Rebellion is an international indie band formed in London, United Kingdom around 2001, consisting of Tennessee-native Nathan Nicholson (vocals, guitar, keyboards), Australian Todd Howe (lead guitar), and Englishmen Adam Harrison (bass guitar), and Piers Hewitt (drums). They have so far released an eponymous EP, and three studio albums, Exits (2005), Union (2009) and The Cold Still (2011). The Boxer Rebellion's third studio album, The Cold Still (2011) was mixed and produced by Ethan Johns at Peter Gabriel's Real World Studios. The album was released on iTunes on 1 February 2011 in the United States. It is due to be released digitally on iTunes and physically in the UK, Europe, and around the world 7 February 2011, and in France 1 March 2011.